Subject: Giant Hogweed – it’s nasty and it’s here……. 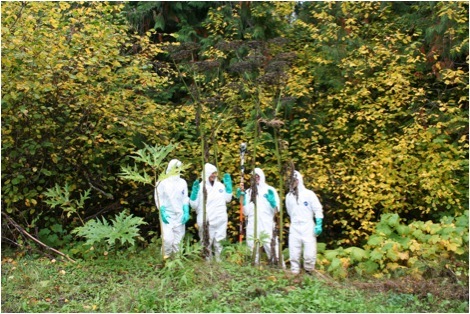 FOR IMMEDIATE RELEASE: October, 5, 2010 Giant Hogweed – it’s nasty and it’s here……. Gardeners may be unwittingly spreading invasive plants throughout the Kootenays. Giant hogweed (Heracleum mantegazzianum), an invasive plant that can be extremely harmful to people, has recently been discovered in the New Denver area. Native to Europe and Asia, giant hogweed was introduced to North America as an ornamental plant in the early 1900s. It is now present in BC, Ontario, Quebec, Nova Scotia, and Newfoundland, as well as a number of US States. Gardening enthusiasts grow giant hogweed for its majestic size, up to 5 meters high, its huge tropical-looking leaves and white-clustered flowers that can grow up to 1.5 meters in diameter. Apart from this plant’s astounding size, it harbors a toxic sap that can cause serious skin burns. Although some gardeners insist the weed can be grown without causing hazard, many experts tend to disagree. Just touching the plant won’t generally cause a reaction; however, if you brush against a broken leaf, stem or stem hairs and get the sap on your skin, you may be in trouble. Contact with the sap, followed by exposure to the sun, can cause painful blisters within 48 hours and scars that can last up to six years. The allergic reaction that this plant sap causes is technically called “phytophotodermatitis.” In addition to causing blisters, getting the sap from giant hogweed into the eyes can cause temporary or permanent blindness. Although many of the concerns with this plant surround human health, there are also ecological consequences. Giant hogweed is an extremely competitive and aggressive plant species, due to its tolerance of full shade, its ability to grow vigorously in early spring, and its ability to produce up to a 100,000 winged seed’s that can float for three days before becoming water logged and sinking. These seeds can even remain in the soil for up to 15 years! Due to the large size and rapid growth of this plant, it can quickly invade and dominate sensitive stream banks, decreasing the habitat available to native plants and wildlife and increasing erosion during the winter months. Proper identification of giant hogweed is the first step to preventing these plants from harming you or your family. Giant hogweed is often mistaken for other plants in the carrot family, to which giant hogweed belongs. Cow parsnip (Heracleum lanatum) for example, can be easily confused with giant hogweed. Both have an umbrella-like flower head of white blooms and can grow in moist soil conditions. Hogweed can also be confused for angelica (Angelica spp. ), Queen Anne’s lace (Daucus carotais), and water-hemlock (Cicuta douglasii). However, the characteristics that easily distinguish giant hogweed from its look-a-likes are three key features: its giant size (1.5-5 m), its sharply-cut shiny leaves (like a jagged saw edge), and its prickly, purple-spotted stem. The CKIPC has received several calls this summer regarding giant hogweed sightings. The CKIPC works throughout the Central Kootenay region to educate and raise awareness about invasive plants and their impacts. In addition, they work collaboratively with private landowners and various agencies to prevent the introduction and spread of invasive plant species and coordinate management initiatives. Crystal Klym, coordinator for CKIPC, would like to thank the public for being so diligent in reporting potential sightings of giant hogweed. “The increased public awareness and involvement has been greatly appreciated. Without the dedication and participation of the general public this plant would not have been found and controlled,” said Klym. Although giant hogweed has been eradicated for this season, the CKIPC will conduct follow-up efficacy checks for the next few years, to ensure this plant does not re-emerge. IPCBC Hot Spots crew preparing to cut down giant hogweed. Individuals can report invasive plant species sightings to the CKIPC at 250-352-1160 or coordinator@kootenayweeds.com. For more information regarding invasive plant species of concern within the Central Kootenays, please visit the CKIPC website at www.kootenayweeds.com. The CKIPC is a non-profit society that delivers education and awareness programs, and promotes coordinated management efforts of invasive plants in the Central Kootenays and the Kootenay Boundary Area A and B. For more information or to get involved go to www.kootenayweeds.com or call 250.352.1160. The Invasive Plant Council of BC is a grassroots, non-profit society working collaboratively to build cooperation and coordination of invasive plant management in BC. Workshops, activities, and events educate the public and professionals about invasive plants and their potential risks. Events like this Outreach Program will continue to assist the IPCBC “Stop the Spread” through outreach and education; thus minimizing the establishment of invasive plants. Funding support is provided by Western Economic Diversification, Community Development Trust. Initiated and mentored under the vision of the Fraser Basin Council, the Invasive Plant Council of BC is recognized across the country for its leadership in building collaboration to the challenging and exploding problem of invasive plants.